Trojan’s dominance in deep cycle products is not an accident, but rather the result of years of R & D investment, continuous product testing and adherence to strict manufacturing procedures. Unlike high volume battery manufacturers, Trojan has not gone into high speed plate production techniques; nor have we sacrificed the quality of our product by using other shortcuts. Rather, we still produce CAST grids with heavy WIRE and FRAME design. To each grid, Trojan applies its specially formulated Alpha Plus paste formulation. Its the optimized paste density of this proprietary formula which provides our products with their superior cycle life. Another Trojan exclusive is its curing process. Once the grids are pasted, they are placed in specially constructed curing rooms which are temperature and humidity controlled. Then they are slowly cured. This provides Trojan deep cycle plates with the most tenacious active material. Once the plates are cured, they are then hand assembled, sealed and formed. 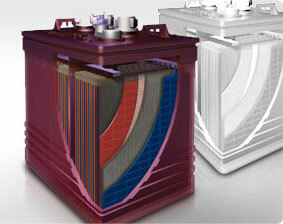 Trojan deep cycle batteries have consistently delivered a greater number of cycles over the competition.